It’s been so long since Google released the aptly named Mobilegeddon update, all the way back in April, 2015. However, since then things have been relatively quiet on the Mobile SEO front. Yes, we had the release and push of AMP pages, and Google Maccabees incorporated some Mobile algorithm changes, but so far, we’ve been in the calm before the storm that is the Mobile-First Index. All of that is set to change very soon! At the end of January, Google announced an up and coming algorithm update; Google Speed – and when Google actually takes the time to pre-warn you about an update, you know it is going to be big. The last two times this happened were Mobilegeddon itself, and the aforementioned Mobile-First Index. Both of these were massive changes in the SEO landscape, so expect Google Speed to be the same! Thankfully, it’s not all doom and gloom. Google Speed is an update that will target something Google has been banging on about for ages now; Page Load Speed. This is something that we’ve been working with our clients on for so long now that it is basically embedded in our brain, and it should be the same for all of you. In essence, you need to make sure your website is as fast as possible across all devices, not just Desktop. That means you need to be looking at how long your pages take to load on Mobile and Tablet devices, and fixing any issues accordingly. Google’s Pagespeed Insights – gives you a rough score and top level view of things that can slow your page down. GTMetrix – gives a far more in depth look at the various issues on your website (note, you’ll need someone adept in SEO or web development to make sense of it all and fix the problems). AMP – for news, articles and blog posts, Accelerated Mobile Pages load lightning fast, and Google will use these instead of the standard page for checking page speed (note: in order to avoid content duplication and AMP errors, a skilled web developer is needed to ensure all is as it should be). These tools are just the tip of the iceberg, as there are various different tips and tricks that can be implemented to bring your page speed down. Starting with these tools is the best idea, but as of now, Google has released a new set of tools to help even further! 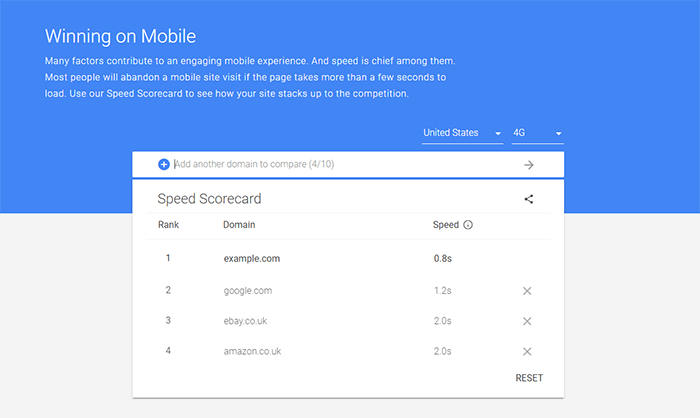 In order to help you get your website performing even better, Google has just released the “Winning With Google” Mobile Speed Scorecard. As you can see from the screenshot above, it is basically a comparison tool that allows you to determine how fast you are against your competitors. This is an incredibly useful tool for working out just how much work needs to be done to put you ahead of the game. You can select which country you want to run the test from, and what connection type as well, meaning that you’ll get a very accurate result on how fast your website actually loads. This is a great indicator of where you stand, allowing you to put a plan in place on how to tackle pagespeed issues. 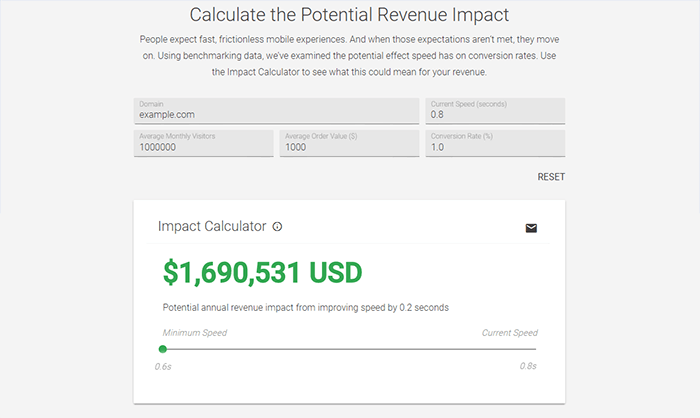 If the Score Card wasn’t enough, part of the same tool (just scroll down a bit further) is the Impact Calculator. By entering your domain into the tool, as well as your average monthly views, average order value and conversion rate, you’ll be able to see how much of an impact a fast load speed could have on your revenue! This is a hugely powerful tool, as it can help people to understand the important of page load speed. It also helps you estimate the return on investment you’ll get for all the hard and tiring work that goes into making a website as fast as possible! If you haven’t been working on your pagespeed yet, or if you’ve been putting it off in favour of other changes to your website, no is the time to get started. We don’t have long until Google Speed hits our digital shores (July this year), so you need to put a plan in place as soon as possible! That way, when Google Speed finally lands, you’ll reap the rewards, rather than plummet into the abyss of Page 3 of the Search Results and beyond. Increasing your page load speed can be a major undertaking, though, so if you need help or advice on how to do it, we are more than happy to discuss your options. So why not get in touch today and start down the path to a better website, more traffic, increased conversions and, most of all, being protected from Google Speed?